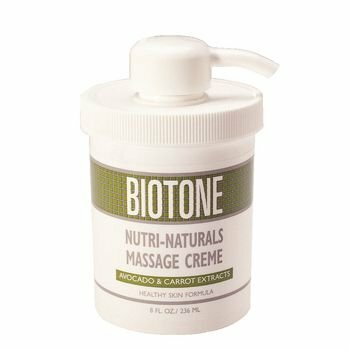 Nutri Naturals Massage Lotion - Gallon (128oz). Easy To Apply, Non Greasy. Daily Skincare Moisturizing Lotion. Avocado, Carrot, Sunflower, Wheat Germ Oil. Made In The USA By Biotone. Paraben, Cruelty Free. Nutri-Naturals Massage Lotion combines skin healthy, vitamin rich ingredients to create a silky, emollient lotion that goes beyond basic moisturizing. Easy to apply and non-greasy, it provides gentle friction, and the ideal glide, that leaves skin smooth and nourished. Blended with deep-moisturizing Avocado Oil, vitamin fortified Carrot Oil (Beta Carotene/Vitamin A), Wheat Germ Oil (Vitamin E), Vitamin C, healthy Sunflower Oil, and healing Jojoba Oil. Perfect for full body massage. Renews and revitalizes skin without residue or tackiness. May also be used daily as a skin care moisturizing lotion. Light garden-fresh scent. Ingredients: Water, Octyl Palmitate (coconut oil ester), Sunflower Oil (Helianthus Annuus), Avocado Oil (Persea Americana), Wheat Germ Oil (Triticum Vulgare), Jojoba Oil (Simmondsia Chinensis), Carrot Oil (Daucus Carota Sativa), Vegetable Derived Emulsifying Wax, Extract of Avocado (Persea Americana) and Extract of Carrot (Daucus Carota Sativa), Vitamin E (mixed tocopherol), Behenic Acid (vegetable softening agent), Glycine and Glycinates (amino acids), Grapeseed Extract and Grapeseed Oil (vitis Vinifera), Iodopropyl Butylcarbamate, Citric Acid (natural pH balancer), Dimethicone, Carbomer, Aromatic Extracts and Fragrance. Shelf Life: 18 months. Will freeze. No problem once thawed.